,We are the ZheJiang JuShen chemical industrial CO.,LTD. 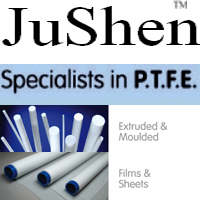 specializes in supplying a wide range of PTFE products. It is been founded in 1997,the major products are PTFE rods, PTFE sheets, PTFE tubes, PTFE tapes, and some metal&PTFE product, ect. Shipping approximately $10,000,000.00 each year. Most of our customers are from America and Europe. We are pursuing high quality from all-round management, and have won customers' satisfaction by careful manufacturing and keeping faith in delivery. No matter the quantity is small or sizeable, we attach importance to each chance and with our best to tend on each enquire and purchased order. Quality First and Credit Supreme" is our concept. We would like to cooperate and develop with you through supreme quality, reasonable price and excellent service. If you are interested in any of the products we currently have available, please contact us with your detailed requirements. We are looking forward to receiving your correspondences in the near future.